My very good friend Doug has now delivered the promised baseboards - he has built in one week what it would have taken me months to do! 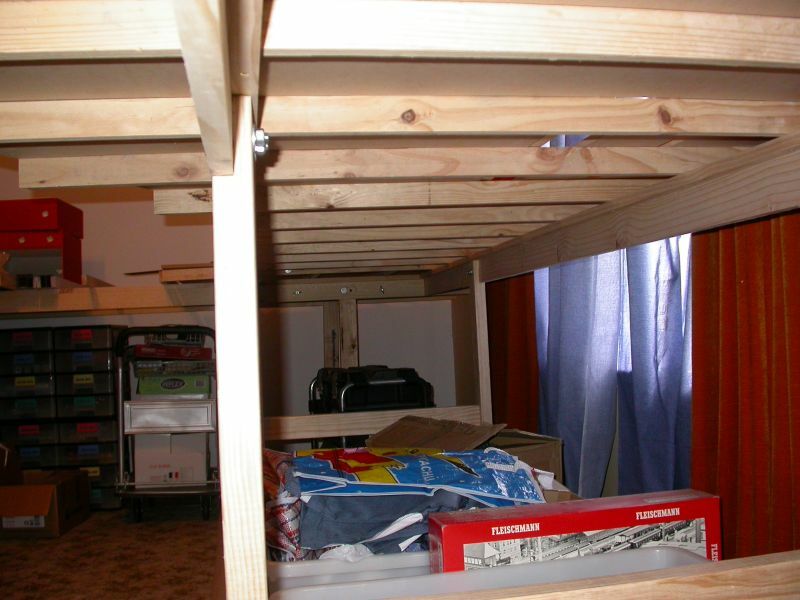 What's more, as a professional in the building industry, he has produced something far more professional than I could do; the carpentry is superb. I have started to play around with track to check that what I have drawn on my plans will actually work and, so far, the indications are that it will do so rather better than I had hoped. I have to start with the London Underground tracks which will form a self-contained double track circuit on the lower level, with two crossovers and two loops to store extra trains. Trains will be of four, five or maybe six coach lengths. Where the three car CO/CP train is sitting is where the island platform will be. The outer loops are for storing one train each and will not have platform faces. 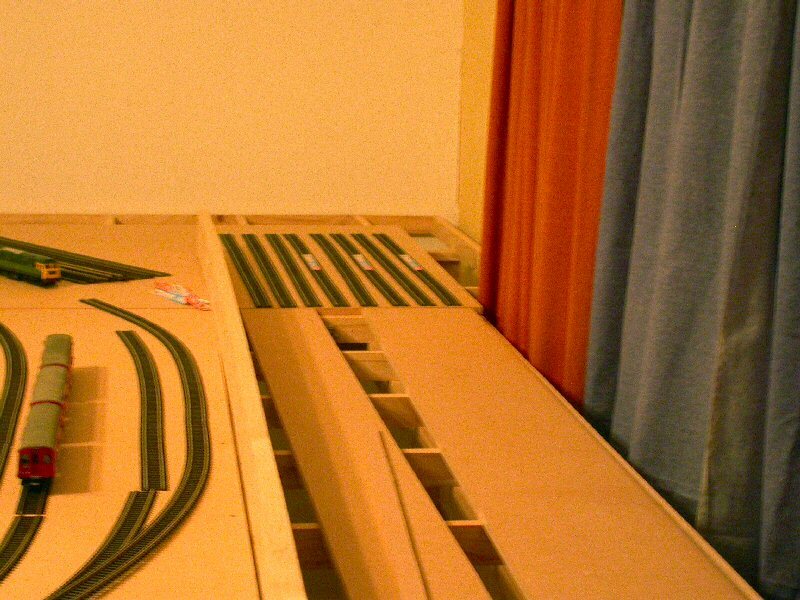 After that, the upper double track circuit will represent British Rail main lines with eight storage loops at the rear (hence the eight lengths of track in the pictures at the far end demonstrating that they will easily fit the space). 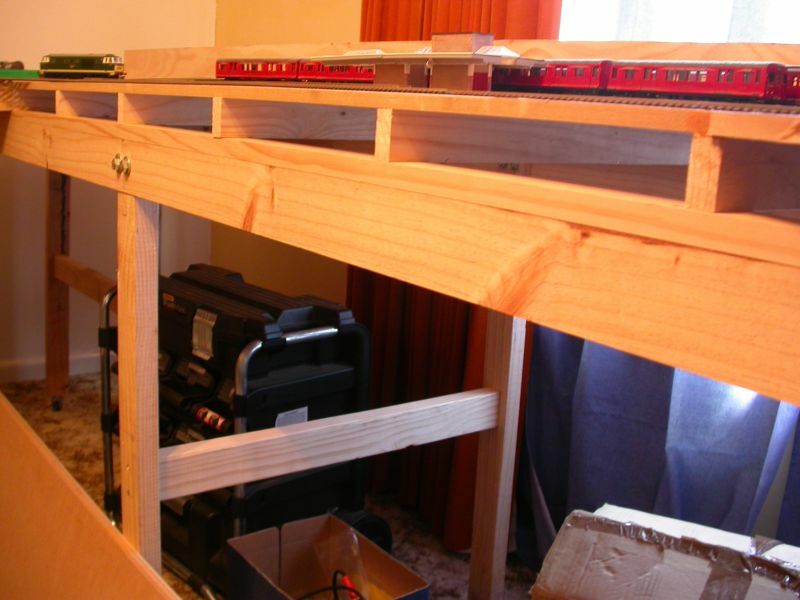 Most of the loops will be able to hold an eight car EMU or a loco with seven coaches. 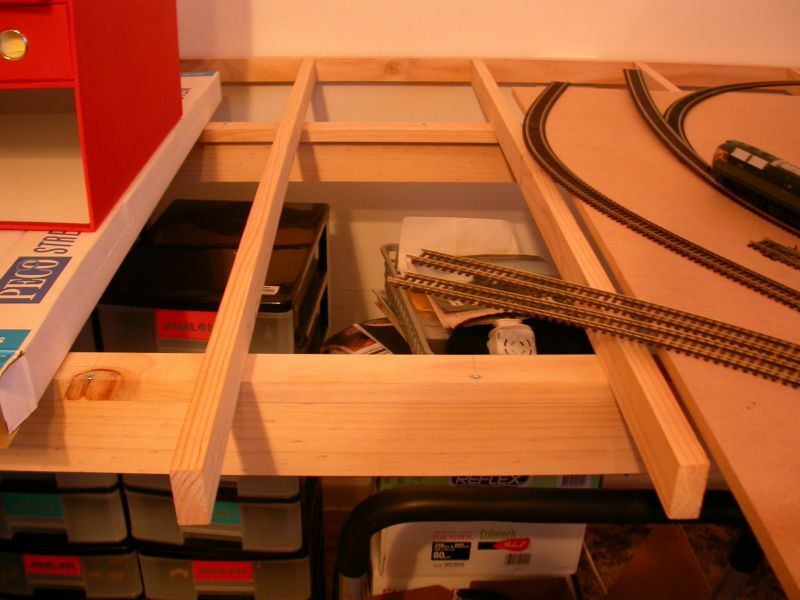 The loops (which double as a fiddle yard) will be on open display so will be ballasted eventually. There will probably be no station on these lines, although I had also thought of modelling an abandoned/derelict station. All this is in a sort of L-shaped dumbell, so no duck-unders required. To reach the farthest places, Doug has thoughtfully put everything on castors. The first pics were taken after dark so have a little bit of a colour cast to them - I have only partially corrected this. Doug delivered it on Christmas Eve. What a great Christmas present. 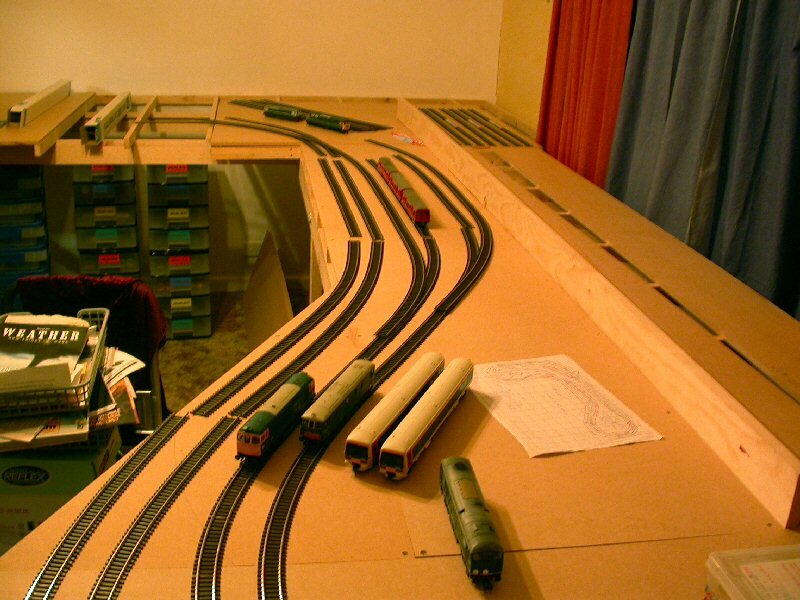 Now most of the rest is up to me, although here are a few corners to trim later - Doug deliberately left them so I could have room to move with the track laying and scenic ideas. The heavier locomotives are holding the lengths of track in place (very roughly!) while the two class 166 driving coaches are the longest and widest vehicles I have so will be used for all gauging and clearance purposes. He's done a nice job of them, Jeff. It looks like you've lashed out with new curtains and a paint job as well. 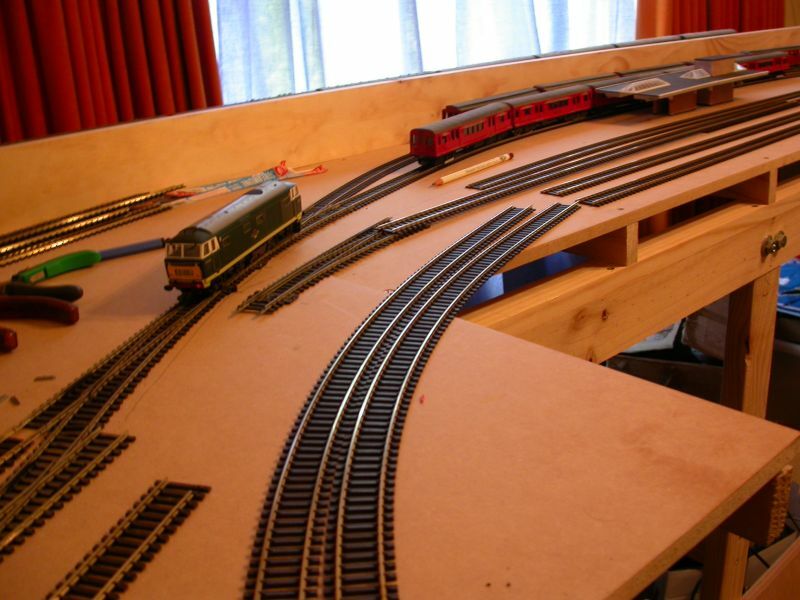 Having seen your old layout in the flesh, I'm sure this one's going to be great. Thanks Max. Doug has done a lovely job on the woodwork. 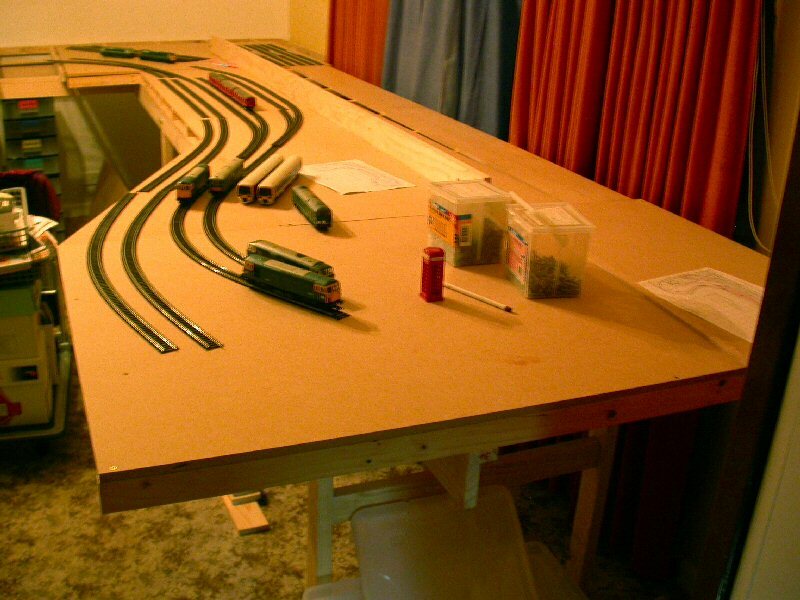 If you remember my old layout, I was responsible for the crime of the carpentry. The orange curtains are quite old and have been there since the year dot! Agnes put up the blue curtains only a few days ago so they are brand new. We had a painter in to redo the ceiling in our sitting room (which was the old train room where you saw the original layout) so Agnes had him repaint the end wall in the new train room at the same time. I will scan a version of the track plan in soon, although I should point out that I haven't finalised how I'm going to do the loco shed and sidings yet so any drawings of that area are still works of fiction. 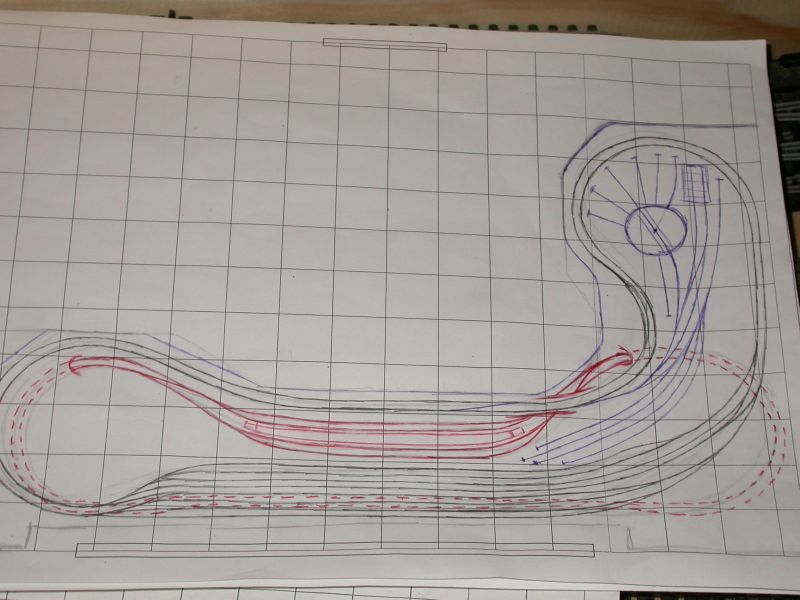 I have now scanned in two variations of the trackplan. The final version has featues from both. 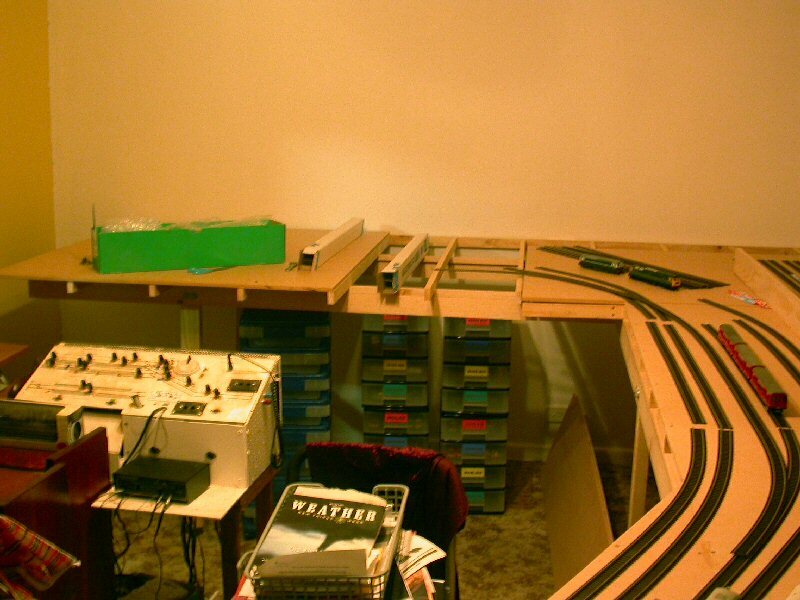 The first one is more accurate regarding board sizes while the second better represents the track layout along the narrow stretch, with the Underground station. Both have ideas sketched in for scenic features and the loco shed and sidings - I may or may not use these ideas. The rear upper level loops are better represented in the first plan. I have been playing with track and formations and it all seems to work. I have now come up with a variation for the Underground, where it could return in the corner of the "L" forming a simpler oval. 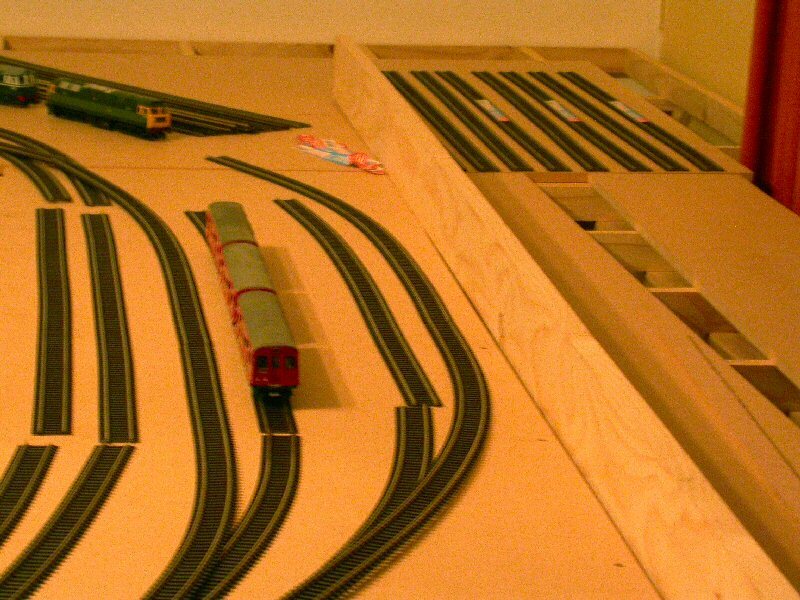 I used some Hornby set track 20" radius curves to check the clearance and it would work if I want to go that way. It would also give more room for sidings in the engine shed area. Yet more ideas to ponder! Looks good Jeff, plenty of space to play with. I like the Underground O/P stock train, may I ask what make it is? The curves are showing already, bon courage! The CO/CP stock is really Harrow Models Q38 stock but I have modified one DM with no end vent and numbered all accordingly. The Harrow Models kits were white metal and are still available from their designer, Phil Radley (Radley Models http://www.radleymodels.co.uk/). He has also modifed most of the kits to have one-piece resin bodies rather than the multi-piece white metal parts - each CO/CP/Q38 car has six pieces for each side; the F stock is worse! 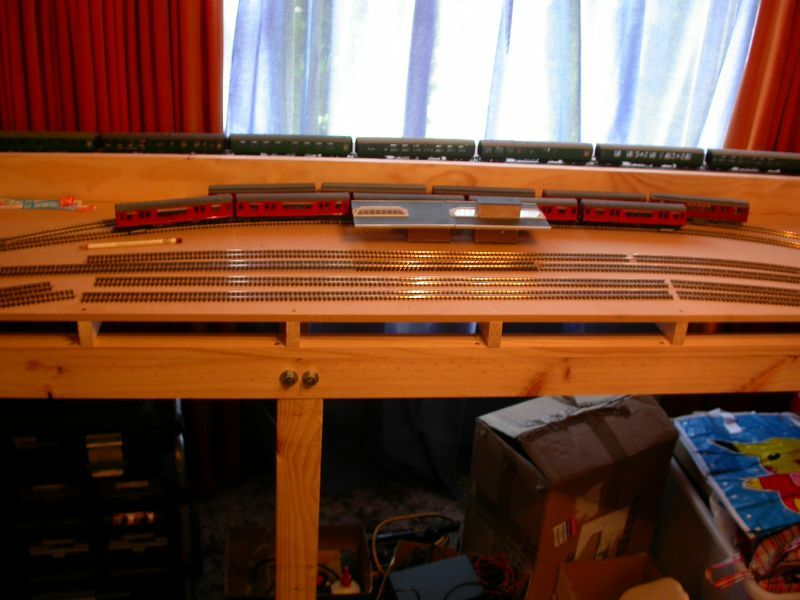 That three-car set is unpowered and I am using it for gauging purposes, mainly to set train lengths for the storage loops and platforms for five or six cars. The remaining two-car unit is powered by two Black Beetle motors. DCC-ing it is going to be interesting! Next I'll be setting up eight BR mark 1 coaches to represent two 4CEP units along the back so I can see how long I need to make those storage loops for the main lines - the drawings have really been pure guess work so far. 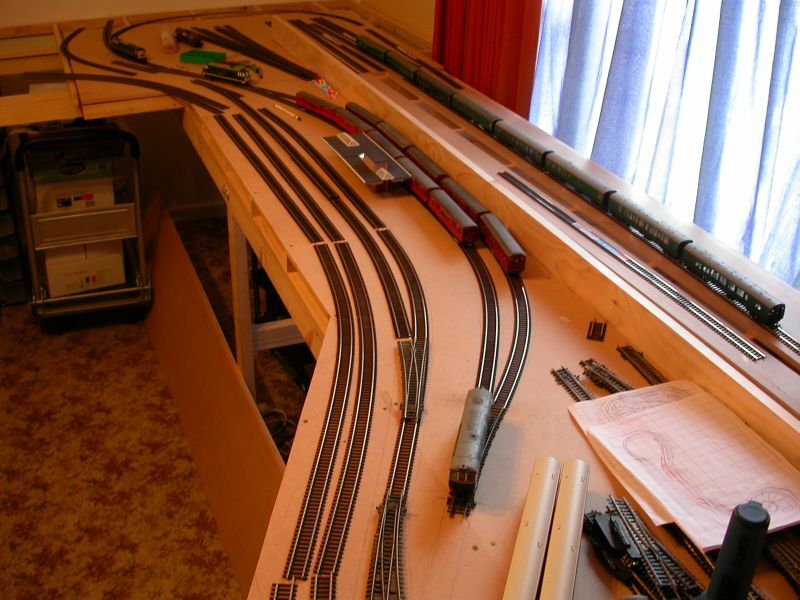 Good progress Jeff and some interesting ideas on where the layout might go. One thing about running underground stock is that the short car lengths make possible some really quite tight curves (as indeed is found on the real thing albeit here it is the curves which dictate car length) so 20" Setrack would almost be generous! Looking good Jeff. As a matter of interest the real Class 166 are the widest stock to run on BR as well, having been built to take advantage of the generous loading gauge of the GWR (a legacy of that nice Brunel chap who had the foresight to recognise we would need large trains in the future!). Watching with interest jeff . 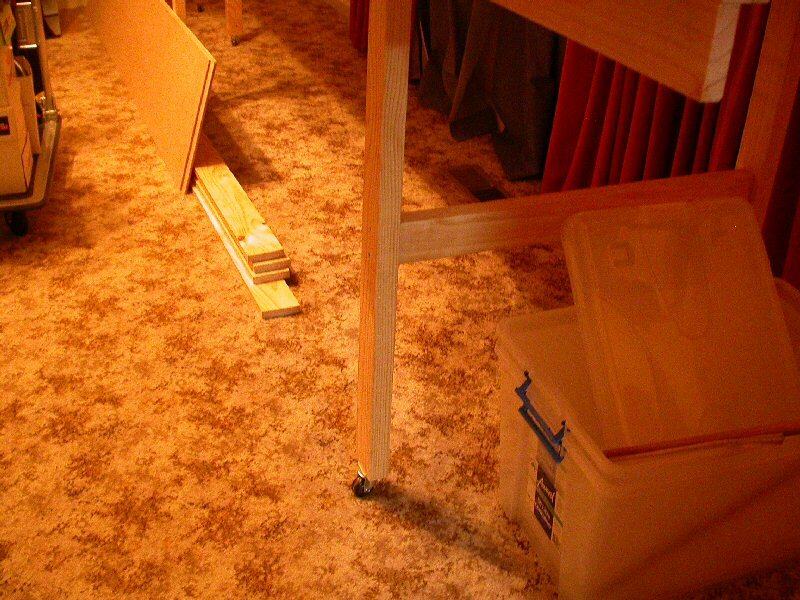 Keep the old curtains they may come in handy for hanging on the base boards to cover the storage area below. 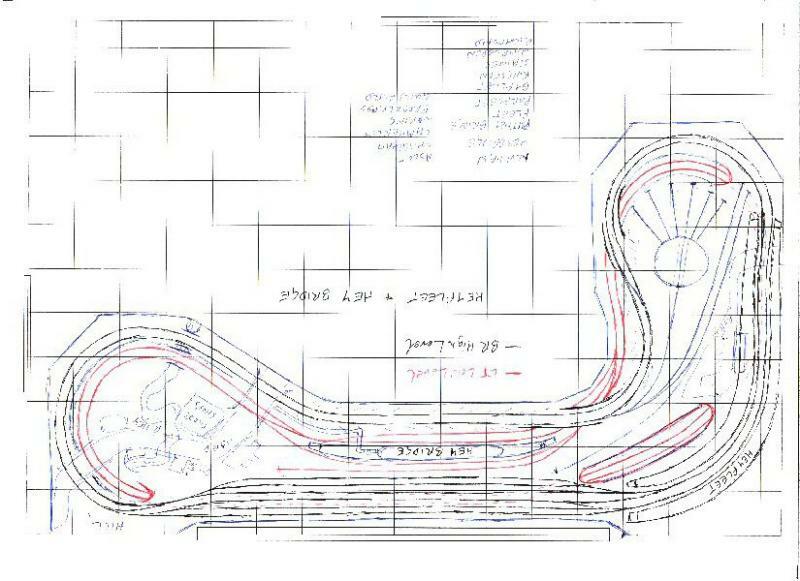 Here's the plan showing the alternate route for the Underground I mentioned earlier. 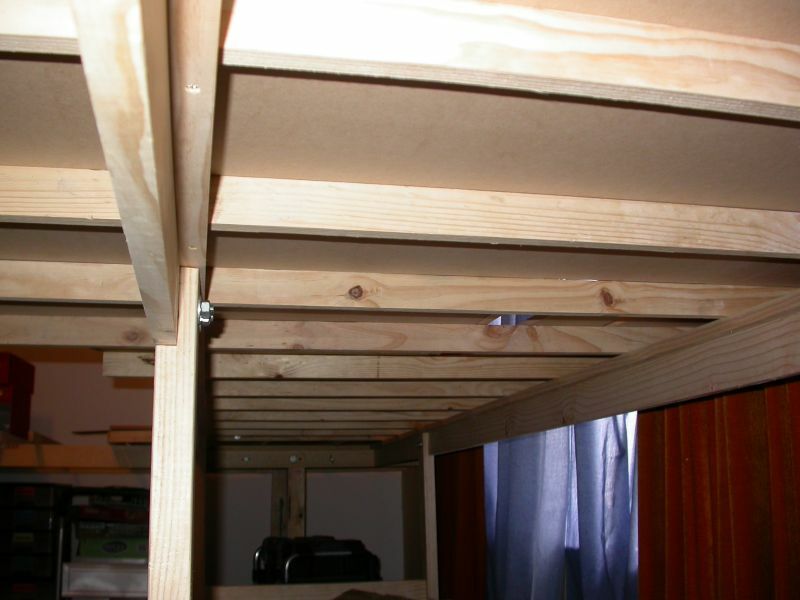 Also, a few photos showing the board framework and L-girder construction. ... and now some further progress with the track laying. 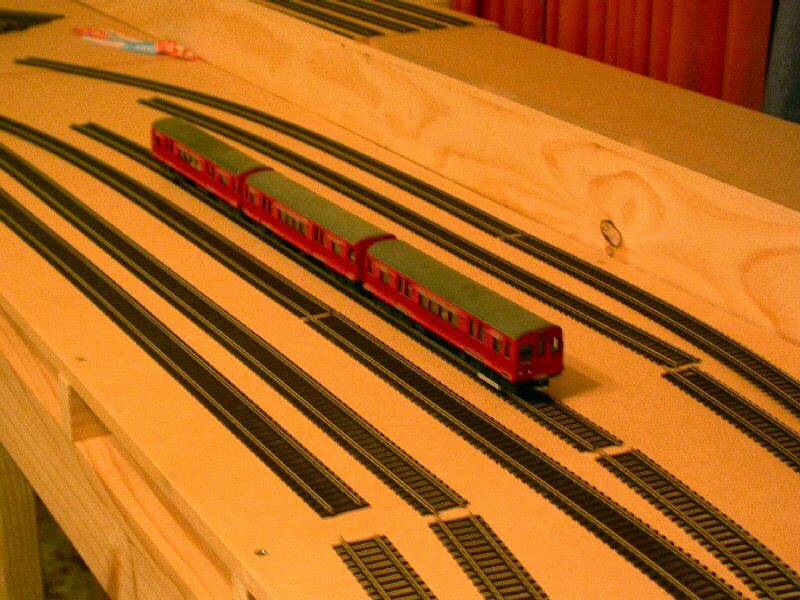 I have cut and fitted the track for the Underground station area on the far side of what will be the platform. Nothing is pinned down at this stage (hence all the heavy Heljan and Bachmann locomotives anchoring the track; fixing it will have to await delivery of the new points from Hattons, plus cutting out the holes for the point motors and painting the boards. 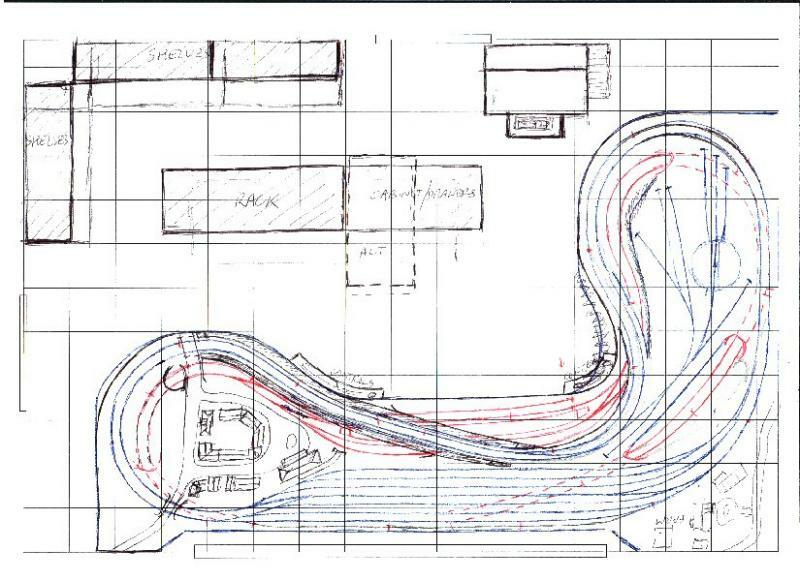 As can be seen, I have clearance for up to six-car LT trains in the loops. In the background you may notice an eight-coach pseudo- SR EMU. That was also for gauging purposes to see how long the storage loops have to be as it turns out, my drawings and sketches have proved to be pretty close to the mark. The train itself consists of a half-built 4BEP, using Southern Pride pre-coloured sides and MJT driving ends on old Triang-Hornby mark 1 underframes, and four ordinary mark 1 coaches (three x Bachmann and 1 x modified and repainted Mainline). Looking very good there Jeff and with particular reference to the carpentry skills. That's a fair bit of work gone into the boards alone. Are those the ones you had custom-made? Looking forward to seeing how the rest of this project develops. Thanks Rick. Doug built them to my size and shape specifications, with some corners still left on for trimming later. The method of construction was of his own choosing and is strong but heavy ... that suits me fine! There are still some bits of MDF to be delivered / collected to fill in the gaps and provide the high level support. I have enough to go on with while Doug and his family are on holiday on the Gold Coast. 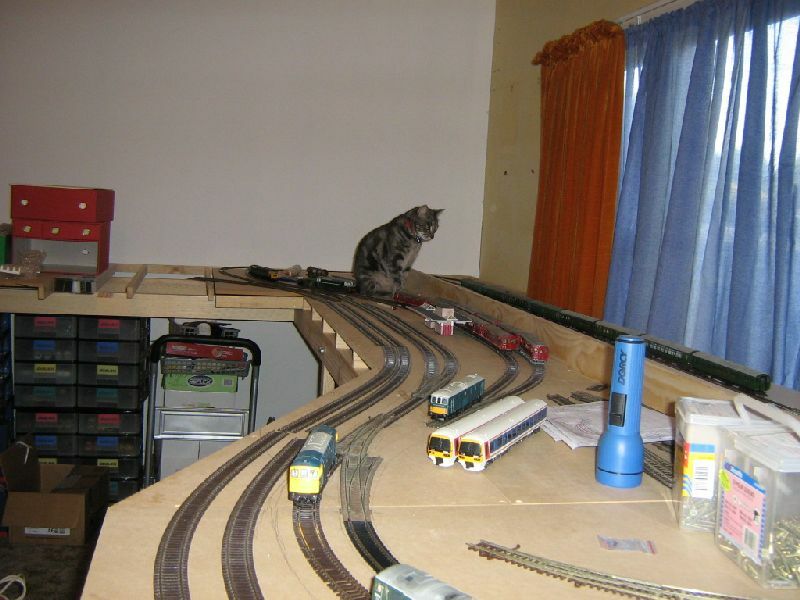 Our feline companion Toby decided to inspect the new works, especially as I have allowed him into the train room while he can't damage anything - normally the doors are hooked closed so he can't get in. 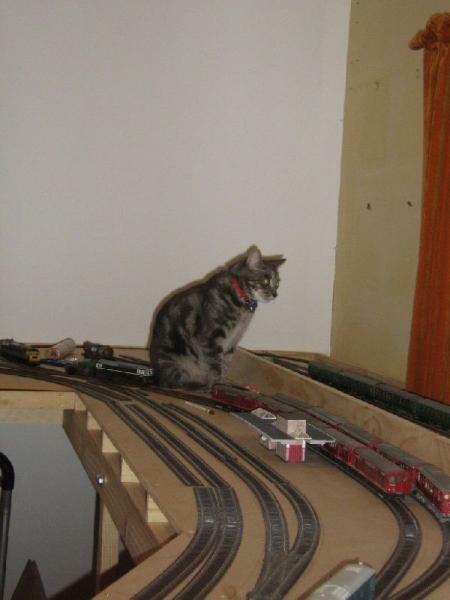 He loves the trains running, even more so if they have sound (we nicknamed him TechnoCat since he also loves computers and the laser printers when they are turned on). When I was running the old layout I had to unhook at least one of the doors. Toby just shoves the sliding door aside and walks in to watch and play. EDIT: attempted to fix the aspect ratio on a couple of the pics. 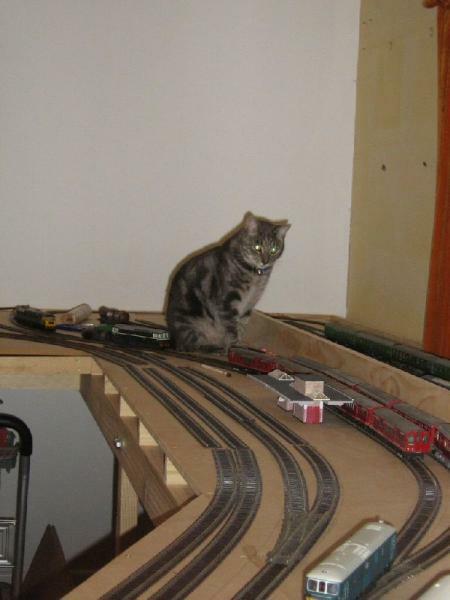 Our Abysinian Pussles, pounces on the trains, so she is not allowed on the layout anymore since the Great Train Wreck of 2010. 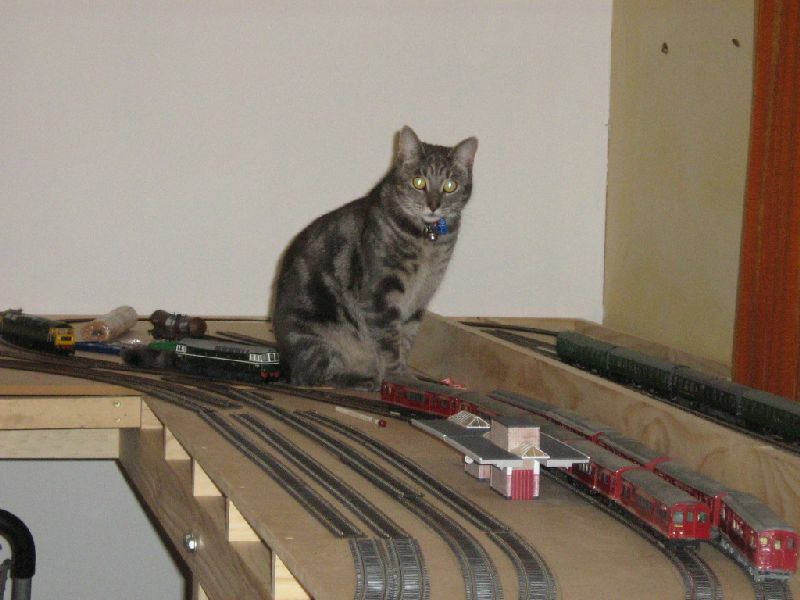 Yes, Toby liked to push the trains around so he was only allowed in if I hung onto him tightly while he watched the trains! Rick, he was most interested in the blue class 33 CAT just behind the plank because it was making loud noises!